Craftsman flair abounds on this three car garage from the shingle siding to the charming rooftop cupola. 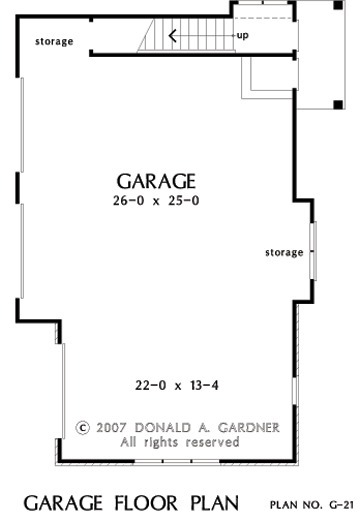 Three car bays plus extra storage on the main level offers space for extra vehicles, lawn equipment, and â€œtoys.â€ The upper bonus room awaits the imagination of the homeowner to be finished as you wish. 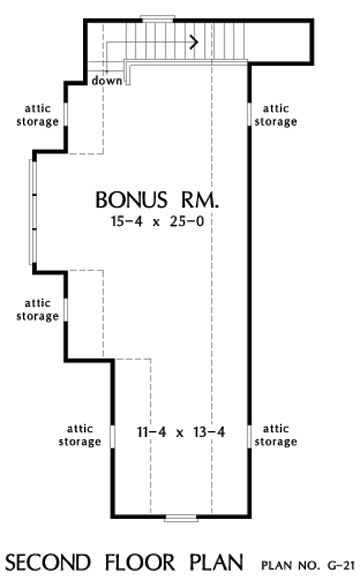 Five copies of the construction set of garage plan. 2nd Floor: 677 Sq. Ft.
House Dimensions: 28' 4" x 44' 0"
Bonus Room : 15' 4" x 25' 0" x 8' 0"
Garage : 26' 0" x 25' 0" x 0' 0"
Garage Storage : 6' 8" x 3' 8" x 0' 0"
Garage Storage Bay : 1' 8" x 9' 4" x 0' 0"
Other : 5' 8" x 4' 8" x 8' 0"